A huge comfy sectional (with washable covers- score) in a gray-brown hue. The fact that this baby is $848 has me permasmiling. Some sort of woven round ottomans (like these) that can be moved around for casual texture that can double as extra seating in a pinch. This sleek TV stand in high gloss gray from Ikea (we figure a room that’s big enough for a large sectional will probably dwarf our current TV stand, so we might need to go a bit bigger). A lovely wool rug like this one with a gray and lime green modern design- although the price for an 8 x 10 (which we’d need with a large sectional) has us sweating a little. Maybe it’ll go on sale? This cool white deer head hanging above a fireplace or even above a nice wide doorway (it would look so great with our exotic animal-inspired lime and caramel colored zebra pillows). Some bold green curtains like these (which we could DIY with fabric and hem tape, just like the ones we made for Clara’s nursery). So there you have it. All the items that are floating around in my head for our future living room- at least at this moment. I’m so friggin’ impatient. I’m like that kid in the back seat asking “are we there yet?” every two seconds. I am loving gray walls these days. So sophisticated and grown-up, but still soft and pretty. Ballard Designs has some really small antler wall plaques (see ’em here) that might be more your style! Love those too- especially for over a doorway since they’re much more diminutive and almost “delicate” looking. It is very exciting to see you kids tossing a more saturated color pallate around!! I would love to see some rich pattern curtains in the new abode!! Looking forward to the 2nd house love. I love that even your deer head is creamic white!! LOL! I love it, but it’s so different from your current style. What do you plan to do with the old stuff? We plan to work with whatever we can (depending on the new house’s layout, etc) and craigslist/barter/donate what we can’t. I love that paint color! I am getting ready to paint our living room a nice shade of “greige” – a vast improvement over the owner’s previous color choice, a salmony tan – and I was sort of thinking that a gray sofa might be too much. I’ve been looking for an affordable one with a linen slipcover instead. But seeing this mood board, I like the charcoal color with the lighter gray! Especially since I plan to mix in lots of other neutrals like chocolate brown and tan and pop in some bright aqua. I love seeing you guys branch out from the beachy style of your current casa! I definitely love the beachy style too, but it’s fun to see you guys embrace palettes that are a little more dark with these bright accents. I love this! I’m trying to decide on what to do with my living room too and I’m curious what your thoughts would be on light fixtures. Do you have any ideas on a light fixture for the living room of your new place? We generally love big drum pendants and capiz chandeliers among other modern and clean solutions, so we’d probably start there. and I LOVE IT! Now that I have convinced my dog that it’s not a giant dog toy it looks amazing in my living room. And it’s comfortable to sit on or use as a footstool. Oh my goodness, I love this mood board! My family is making the switch from homeowners to landlords/renters next month and this color palette (and that same couch, incidentally) have been rolling around in my head for a few weeks. Can’t wait to see what you guys end up doing! I am impatient too but I am really intrigued as to whether your choice for the new digs is one of the properties that you previously featured in your pros/cons review of houses on the market. Come on Sherry and John, have we seen this gem before? Nope, all the houses we shared weren’t it (we were waiting to get that enamored feeling the moment we stepped in the door). Can’t wait for your new house either!! Just curious, what will you guys do with all your old furniture? Are you keeping any of it or starting all over? Seems so spendy, eek! We plan to work with whatever we can (you know we love making do with what we have) depending on the new house’s layout, and then we’ll craigslist/barter/donate what we can’t use (since a lot of our furnishings were scored on the cheap anyway). I painted my living/dining/kitchen area a lovely greige and it seems to be the perfect neutral. I must say though that picking out a grey color was the hardest thing I’ve ever done related to paint. It was crazy! I ultimately went with Benjamin Moore Revere Pewter color-matched into Sherwin Williams Superpaint. I miss when you did mood boards for your fans who had design problems to tackle! And I realize that your blog has grown and changed, but during this in-between time, would you consider doing a few for some lucky users? Let me know, would LOVE your input on my living room, we just moved to an apartment in a Victoria building built in 1906, and our living room is looking dark forlorn. Sadly with our house hunt in full swing and our house on the market (as a for-sale-by-owner no less) we don’t have a minute to spare when it comes to whipping up client-commissioned mood boards, but we promise to make a big announcement if we ever decide to reintroduce them! I love, love, love your current decor so I am having a hard time jumping on board with all this change. However, looking forward to seeing all of your creativity decorate your new home. We just bought that sofa 2 days ago… and LOVE it!!! And yes the price had us swooning… and the comfort has just chillaxing!!!! Love the mood board! So glad to hear so many good things about the sofa! My favorite color is gray (weird, I know) so of course I loved this right away. I’m so glad to hear people saying how comfy this sofa is! I’m always drawn to the Ikea sectionals for the price but pause because I’m not sure of the quality and comfort factor – big bonus to be able to read people’s thoughts in the comments! Hey Amber…not weird at all. If you asked my friends and family members what my favorite color is they would probably all answer “GREY!”. I cannot resist grey anything, but especially clothing. I love the greens and grays! We’ve had the Kivik sofa/chaise set for several months now and I have to tell you – for the comfort, price, and size, you simply CANNOT go wrong. It’s awesome! We initially planned to get the Lorimer sectional from West Elm, but after traveling to Charlotte and seeing both in person, the Kivik won hands down (can you say “Hello, $1,000 savings”?!). I’m loving grey! I recently painted my livingroom in Pittsburgh Paints Grey Stone, which works well with my greige futon cover and espresso faux-suede storage ottomans. I made pillow covers in a cream/espresso zebra stripe, which “pop” nicely on the greige futon cover. Also, Ive never seen you guys mention this, but it seems right up your uber-creative alley. Have you thought about making a custom rug with Flor tiles? CB2 sells a limited selection of them, but if you order a Flor catalog, the options will blow your mind. We actually have Flor tiles in our basement- love them! Thanks for posting this! My hubs and I just redid our living room (Bought grown-up furniture). Grey couch, chaise (against a wall with comfy pillows so it’s another couch if need be) and ottoman (as our coffee table) from Ikea with two white stacked Lack tables and green accesories. We painted the walls Behr ‘cornerstone’ though so we can easily switch the accent color from green to yellows since our kitchen walls are grey and my office once it’s done will be green walls and grey furniture for meeting clients. Would you place one of each color pillow on the couch, or two of each? I am so into symmetry, it’s hard to visualize. I keep wanting to have matching pillows on my couches. Maybe you could do a post on pillow arrangements? Help!?! If you check out our Projects page (see that tab under our blog header) and go down to our Decorating Lessons category you’ll find a post all about pillow arrangements. We tend to like slight asymmetry ourselves, so for this room we’d probably get two green pillows and one caramel colored one and toss one green one in on corner and one brown and green one casually in the other corner. Love this couch. We’re not househunting yet but will be soon and I was looking for something like this-low to the ground, modern, and comfy/sprawling. But all the Ikea furniture we’ve had has been small and I’d be hesitant to buy something so big and have it come apart in a couple years like a bunch of smaller things we’ve bought there have. Can anyone that’s bought couches/big items from IKEA speak about their durability over time? Thanks! We have heard about a million times how much people adore their Ektorp sofa and sectional over time, so although it’s not this exact model, we have faith that Ikea sofas can be great investments. Anyone with more info to share with Vicki on that subject? I’m not really getting that much of a hunting lodge vibe, but it definitely looks very chic! Cool beans! Love the grey walls and the green curtains with it! I’m not sure if anyone has told you this before, but Home Depot will sell you any size carpet that you want and then edge it themselves for fee that is reasonable. I believe you pay by square foot and it ends up being way cheaper than 8×10 carpets that you usually find at other stores that are already made. If you’re looking for a more solid color with a subtle design, it might be worth looking into. Also I was very disappointed by an 8×10 carpet that i bought a few years ago. it was on sale for over $400 and it sheds like crazy. a sales person at Home Depot showed me which carpets will not do that. I already forgot what needed to say in the description. So good to know! We had no idea. Thanks for the tip! I love the deer head! We have a similar one over our fireplace. I found it at Ross for $19!!! Score! I really enjoy seeing where your design aesthetic is moving with these last couple of mood boards! I for one, LOVE it. 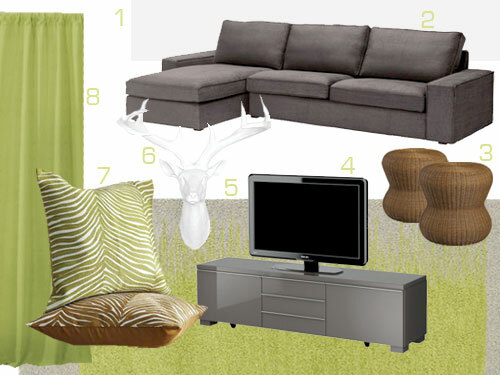 I can’t get enough gray lately, and I like how you’ve mixed it with a fun bright green and some grounding brown too. Nicely done! We have Light Pewter on our living room walls (although we lightened it by just a tad with some white because I wanted SUPER light gray) and I LOVE it. I had the hardest time picking out a perfect gray for our living room and it looks fantastic. The undertones change A LOT depending on the light, but it always seems to work. Our sofa is a very similar gray to the one in the mood board and it looks great with the paint color. Hope that helps anyone considering Light Pewter! We’re putting in new floors before Christmas and our teeny-tiny little family room is just begging for a sectional! I’m swooning over this one, but I’m not sure my husband would go for fabric instead of leather with a dog, a little one, and another one the way. We just got the same exact kivik sofa in october in the grey and love love love it! It’s really comfortable and was no problem putting together! Great investment! Love the mood board! I’m loving the paint color! I’m wanting to go with a gray since I think it will go with a lot of things in my house. I currently have a deep mocha colored sofa that I love. Do you think brown and gray can work well together? I change out my accessories and pillows to add color punches; sometimes red, sometimes green, and orange and mustard in the autumn. Think the gray paint would work with that? Oh yes! That sounds lovely- go for it! Don’t get me wrong, I love your style in this current house BUT the last 2 mood boards you have made have me tingling with excitement for whats to come! They are closer to my own style and colors I love which means it will be easier to mimic and get great ideas from! I “know” my style but never seem to be able to fully pull it together like you do. Keep it up, you guys rock! For the people that have the couch is it big enough for 2 people to cuddle up on it? My husband and i are looking for a couch that is wide enough where we can both lay and cuddle on it but we need a slip cover. Does everyone really like it? but i like the modern one better….any advice? First, love this (as usual)! Second, I too am contemplating a soft gray, like BM’s Stonington Gray for my loft. Love that look! WERE waiting, not ARE waiting? Is this a clue that you have, indeed, found it? We have not purchased anything yet- but we’re closing in on something for sure! Fingers crossed that it works out- at which point of course we’ll share the big news! Ikea actually has a great sofa reputation! Scroll back through the comments for our take on that and other people’s feedback on their Ikea sofas! Just echoing Shannon’s comment on the price difference between the U.S. and Canada! And people wonder why we cross border shop? Especially, when the dollar is at par. someone asked about ikea durability – we bought our ikea couches in 2004 and they’re still going strong. The covers are a bit faded now and we’re regretting that we didn’t get two sets of covers, but they are still very comfortable. and in these past 6 yaers we’ve moved from having one toddler to having two kids and everything. my folks have slept on them as well. no problems with sinking or sagging. actually, we’ve been fine with all our ikea furniture as long as we’ve bought solid wood. Our dining table and chairs are now more than 15 years old and going strong. they’ve been used every day that whole time. Thanks so much for that info Sophie! Amazing to hear! This theme is exactly what I’m going for in my house! Thanks for the ikea media console idea! It’s what we have been looking for. I love your rug choice! Had hoped the rug would be 6′ x 9′ since that’s what I’m looking for. Scored a major rug deal at homedepot.com (Orian Eclipse Brown 7′ x 10′) for $160! Thought I had found a complementary rug (Orian Moodie Blues Multi) for under my dining room table for $110 but it’s too narrow. Darn. Great room ideas!